rom time immemorial the noble sidhe have ruled the fae. Learn their secrets of power: how and why they nmaintain their chokehold over the commoners. This book covers the history of the nobility, from their return in '69 and the Accordance War which followed, through current poiltics and events among the sidhe. Though many envy their splendid halls and delicate Finery, the sidhe pay a high price for their magnificience. They are ill equipped to deal with teh ravages of Banality, but are still subject to Bedlam. here can be the learned the secrets of those sidhe who have succeeded in balancing the dichotomy that threatens to tear them apart. 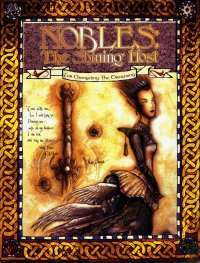 Detailed information on playing noble characters in a Changeling chronicle. A new, previously unknown noble house. This title was added to our catalog on April 07, 2006.